Anti-scatter collimators (also referred to as anti-scatter septa or grid) are used in CT X-ray equipment used for medical imaging, but also non-medical X-ray applications such as cargo scanners at (air)ports. CT scanners consist of an x-ray source opposite an arc-shaped array of detectors. The collimator is located immediately in front of the detectors to protect them from scattered X-rays. Ideally, each detector in a CT scanner measures intensity of X-rays that reach the detector after traveling along a straight-line path from the X-ray source to the detector. 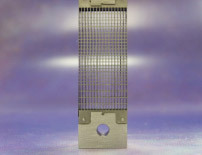 The commonly known anti-scatter collimator is comprised of thin plates formed from a suitable X-ray absorbing material like lead or tungsten. These plates are focused at the x-ray focal spot and generally located between columns of detectors (z-direction) but not between rows of detectors. This collimator is referred to as a "1D" anti-scatter collimator. 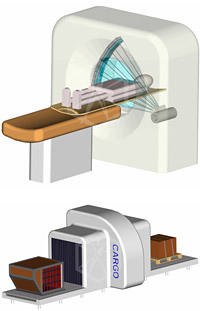 In multi-slice scanners it has been found more advantageous to have shielding between both columns and rows of detectors; both directions are focusing to the X-ray source. 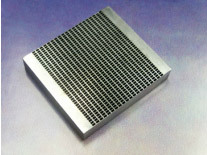 This type is called a "2D" anti-scatter collimator. Have Nuclear Fields consult with you for your specific anti-scatter collimator needs.